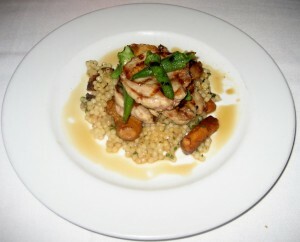 4 quail medallions served on top of herbed Israeli couscous with crimini mushrooms and thyme jus. Folks, it does not get any better than this. This dish is the epitome of fine dining. The challenge is to grill the quail breast just the right amount so it does not dry out and Chef Paul and Chef Scruggs have succeeded in preparing it mouthwateringly tender and juicy. It was very flavorful but still retained the natural beauty of the quail. The Israeli couscous was the best (and most fun) that we have had and complemented the dish extremely well. Also included in the entree were fresh okra and mushrooms that further added to this amazing dish. We send our compliments to the Chefs for this succulent masterpiece. Served with pattypan & zephyr squash, sunchokes, and turnip green pesto. This one will have you saying Hallelujah! You might be looking at the picture below and wondering if this fish is bland since there is no sauce or seasoning on it…wrong! This is one of the tastiest seafood dishes we’ve experienced in Austin. The Grouper is very fresh and firm, with large flakes. This fish has substance to it which leaves you feeling satisfied. The crispy outside is what helps this fish stand out from the rest. Sounds like a minor detail, but wait until you try it! We’ve noticed that Wink pays close attention to the subtleties. The pesto sauce enhances the flavors, and the unique combination of vegetables completes this dish nicely. Warm flourless chocolate cake made with ‘El Rey’ chocolate and zinfandel infused cherries. El Rey is a variety of chocolate that is made from 100% Venezuelan cacao as opposed to other chocolates that are usually a blend from various parts of the world. 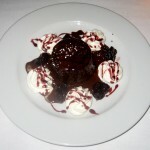 Since we love chocolate, we figured this would be our best bet for dessert! At first sight, this rich-looking chocolaty cake had us salivating, but it did not last long. The cake is too bitter and somewhat dry. The whipped cream wasn’t enough to juice it up, but ice cream (or a tall glass of milk) would have really gone well with this. Overall, this is a solid dessert but could be even better. Creamy vanilla bean infused custard topped with a golden layer of caramelized sugar, biscotti, and mixed berries. If you are looking for a fresh tasting dessert that won’t put you in a food coma, then this is for you. 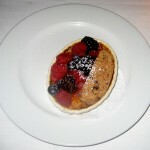 The vanilla bean custard is ultra-creamy, and the blueberry, raspberry, and blackberry topping was plentiful and fresh. The biscotti was an excellent addition and our favorite part of this dessert. However, the custard lacked a distinct flavor and having a bite of it without a berry might leave you unsatisfied. We dined at Wink on a very busy Friday night, but anticipated the rush and made reservations in advance. When we arrived, we were greeted by the laid-back, friendly Maître d’, Mark, who informed us they are running about 10 minutes behind schedule. Since there is no waiting area in the restaurant, we were directed to Wink’s wine bar across the breezeway. Unfortunately, we had to wait here for 30 minutes until our table was finally ready. Once we were seated, we immediately received complimentary hot ginger tea, which we thoroughly enjoyed. We had a top-notch waitress who was informative and checked on us at appropriate times. She was knowledgeable about both the menu items and the wine list – how refreshing! As in most fine restaurants, she also cleared the crumbs from our table in-between courses. By the way, if you are worried you’ll go hungry with small portions, know that the waitstaff graciously replenishes your plate with their delicious warm bread! It is apparent that everyone here strongly believes in “service with a smile,” but their sincerity is what sets them apart. Wink is near downtown, in a small complex and can be a little hard to find. Be sure to turn in when you see the sign! Parking is not an issue because there are plenty of spaces for this charming restaurant & bar. The bar and restaurant are in 2 separate buildings, separated by a small walkway. The bar has a classy, cozy, energetic vibe and felt a little crowded. The restaurant is casually elegant and has a wonderful intimate feel to it. The lighting is impeccable – not too bright and not too dim. This is one of the reasons it’s good for couples as well as small groups. The walls are painted warm shades of tans and browns with minimal décor, but it’s still chic. Even the dishes come out with creative presentations. 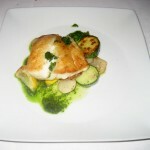 Keep in mind that their menu changes daily – based on the seasons and availability. Also, it’s impressive that the chefs use as many local ingredients as they can. The portions are pricey and on the smaller side, but packed exquisitely with big flavor. Be sure to dine at Wink for your next special occasion and it will be even more memorable!